Two years ago on September 20th Matt and I had our engagement session in Monterey and Carmel, two of our favorite towns. We chose to have our first setting be the Monterey Bay Aquarium one of our favorite places to enjoy together. As we discussed with our photographer, Chance James, who also photographed our wedding, we knew it would make for some amazing and unique images like this one of fish swimming above our heads. We knew of course that there would be other people around. We did find ourselves often in front of families with small children. I do remember being amused by all the children and thinking how great it would be someday if we had a child of our own to take to the aquarium. This wall where waves crash over you is one of my favorite spots of all. The jellyfish are some of the coolest creatures on exhibit. I could spend hours watching them in motion. I love the silhouette our photographer captured against the tank. I spent a lot of time thinking about the concept for our shoot, and had our wedding date painted on my nails in navy against a khaki background color (our wedding colors) so I’d have this image as a possibility for our Save the Date cards. Chance had us interact with each other and have fun in the photos and I love moments like this of the two of us that feel like a natural day for us would go. After spending a lot of time at the aquarium, it was onto Carmel River State Park (where we would do our maternity session almost two years later). For our first casual photos we wore Giants gear. The water was very cold that day, yet it was worth it to get this stunning image of us surrounded by low tide. As usual we spent a lot of time laughing. It’s great to have images of us being silly as we have a lot of fun together. Our last outfit change was into a more formal dress for me and black pants and a navy shirt for Matt. It was a long day for us and for Chance, and we knew we had many great images from which to pick for our Save the Dates, photo album and more. In addition to using the photos for our Save the Dates, we used them for other permanent items in our home. 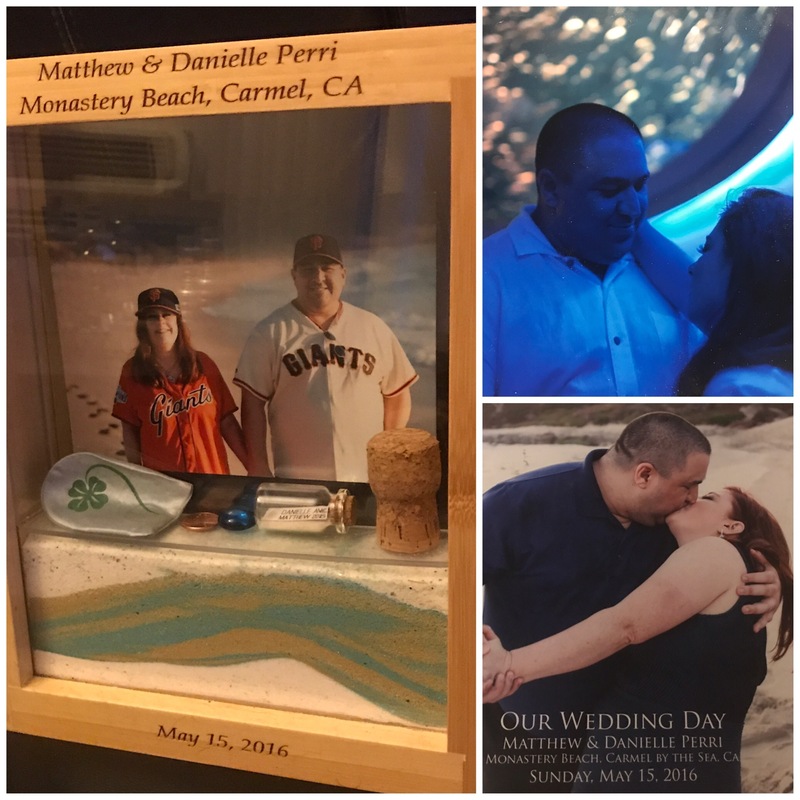 This included our frame used for our Sand Ceremony (to which we also added some personal items from our wedding day), a magnet of one of Matt’s favorite images, and our sign in book featuring some of our best images. Looking at these images reminds me of how much fun we had and how great it will be to take our child to these places someday as well.